Appearance: Roughly the size of a hippopotamus or a large horse, the yale borrowed features from beasts as diverse as a lion and a wild boar. Depending on the legend, its body predominantly resembled either a horse, lion, goat or antelope–most often some odd fusion of all four, with a bit of wild boar thrown in for good measure. Its coloration varied greatly, but its body was often covered in black or tawny fur. However, in heraldry, it often appeared with multi-colored spots dotting its hide. It might have solid hooves, cloven hooves, or heavy paws, but it always had a tail of some sort, usually either tufted at the end like a lion, or long and flowing, like a horse. Occasionally, images show the yale with short stubby nub on its rear instead of a full tail. From its boar-like snout, large tusks often protruded, and two long horns jutted out of its forehead, sometimes straight, other times curved or serrated. 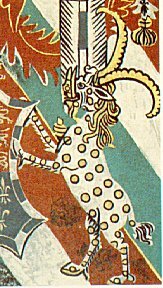 Unique qualities and traits: In descriptions of these horns, the mythic nature of the yale is most clearly seen. According to legend, the horns of a yale could swivel any direction and in battle, one would face forward, the other backward, so if the first was damaged, the second one could be utilized in defense. In the most heated battles, both horns could be employed to defend against more numerous attackers. Some tales even suggest these horns could be rolled up when not in use. 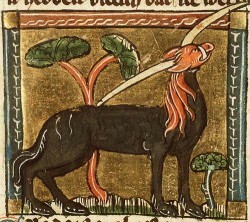 Aside from their practical function in fighting or defense, the yale also used its horns to impale its prey–and according to certain sources, demonstrate its mood. Because of its prowess in battle, the yale came to symbolize “proud defense” in medieval heraldry. The basilisk was considered the natural enemy of the yale. If it encountered the yale asleep, the basilisk would sting it on the forehead, which caused its eyes to swell and burst, killing the beast. Yale University depicts the yale on the president’s banner, the gateway to Davenport college, and the logo of the campus radio station. It also appears in some British colleges. For two centuries following Pliny’s account, the yale received little mention, but then it began to appear with increasing regularity in bestiaries and other accounts, eventually finding a place in medieval heraldry. It first appeared in the heraldry of Henry IV’s younger son John, and gradually was put to use elsewhere. In the 15th and 16th century, many prominent individuals with ties to the royal family incorporated the yale into their heraldry, after which it passed once more into relative obscurity. Overview: Creatures cobbled together from elements of real-world beasts, the yale were endowed with several imaginative qualities, which carried them from the supposedly factual narrative of Pliny the Elder into the pages of folklore and heraldry. Your opinions: Why do some mythic creatures (like the yale) fade into relative obscurity while others maintain a high profile for hundreds or even thousands of years? This entry was posted in Mythic Creatures and tagged Yale. Bookmark the permalink. What an interesting creature. I wish I knew more about prehistoric mammals, because that totally looks like something. I just can’t remember what it would be. Like one of the saber-toothed cats (maybe saber-toothed cats got mixed into the mythos? ), only with massive bottom teeth. I wonder what the “moveable horns” were? Big ears? Antennae? Some kind of tentacles? There’s theories floating around that some of the long-necked dinosaurs had inflatable pouches, like a frog, for vocalizations, along with the remark that “living animals are absurd”. We don’t make our reconstructions of fossilized animals weird enough. And who would imagine a pair of moving appendages on the head of a deer or cat thing, anyway? 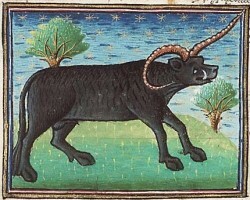 I can imagine the movable horns being any number of things, and I think you’ve tossed out some intriguing suggestions. The tentacles would fit with the theory that they could be rolled up when not in use. Although there’s no way of knowing, it’s certainly fun to guess. Wow, I’d never heard of a Yale before! I’d love to see more postings about obscure mythical creatures. Thanks for sharing this, Sarah! Jessie, your comment was interesting, too. Pouches for vocalization?? Now, that’d be an interesting sight. Great post, Sarah! I always love learning about these wonderful mythical creatures from you. 🙂 And the Yale is truly a fascinating beast. As to your question about why some mythical creatures remain popular and well known while others fade into obscurity, I have no idea. I often wonder that myself. Perhaps the course of history has something to do with it, for instance as one culture or people group would move into an area and take over or at least assert their influence strongly over another one, one people’s mythology would become less prevalent while the other’s flourished. I have no idea if this was actually the case, but it’s a thought anyway. Thanks, Mary! Great thoughts on why some mythic creatures remain popular and others don’t–I can definitely see clashes between cultures playing a role. Some creatures also seem to have had a more universal start, like the dragon, which showed up in Eastern and Western cultures in a variety of forms. It makes sense to me that that the creatures that had a wider reach to begin with have remained stronger in popular culture today…but that’s just another theory. In reality, I’m sure it has to do with a number of factors. I look forward to seeing how you will incorporate it into your story! I first came across this creature in Kew Gardens’ London, where there are ten statues of heraldic beasts. I had never heard of it, but am very intrigued. I’m currently writing a series of fantasy books, and will definitely fit a Yale in somewhere. Thanks for your descriptions and other information. Thanks for taking the time to comment, Erica! I’m glad you found some inspiration for your books. And how fascinating that you’ve actually seen some of the English statues–it’s amazing how often mythic creatures appeared in art and architecture. How was the Yale begun. Do you have a question, a comment, a topic you'd like to see discussed? Designed and hosted by Camna, LLC.